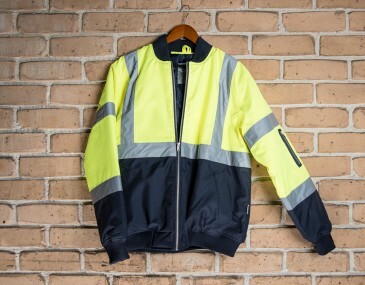 This versatile flying jacket is an excellent choice for high visbility work clothing. It complies with the safety standards designated by the new Hi Vis Safety Garment Standard AS/NZS 4602.1:2011 and AS/NZS 1906.4:2010, holds a high UPF rating of 50+, and is constructed from seam sealed waterproof fabric. Tough, durable, and with a sharp design, this warm, rugged flying jacket is perfect for outdoor work. This garment is made with: 100% Pure Polyester PU Coated. Size guide measurement: Half chest (CM): s- 58, m- 61, l- 64, xl- 67, xxl- 70, 3xl- 73, 5xl- 79 .